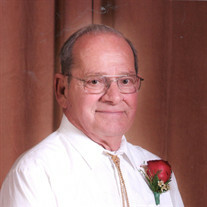 Robert "Bob" Bruce Jones, 80 of Newcastle, Wyoming passed away Wednesday July 18, 2018 in his home town of Newcastle. He was born on September 17, 1937 in Deadwood, South Dakota to Cable and Vera Jones. As a young child, he moved to Newcastle with his family. During high school he began working for his father. On December 5, 1959 Bob married the love of his life, Donna Hedrick Jones. They had four beloved children together. Bob worked for MJT Trucking before finishing his career at Dixon Bros Trucking for 44 years when he retired in 2012. Bob was happiest when hunting with his family, bowling in several leagues and camping with the Black Hills Hillbillies camping club. He is preceded in death by his parents and siblings David Jones, Joanne Huckins, and Judy Mitch. He is survived by his beloved wife, Donna, four children and their spouses: Danny (Joy) Jones, Dallas "Tex" (Debbie) Jones, Jody (Kevin) Mello, and Duane (Lynn) Jones; eleven grandchildren and fourteen great grandchildren and his sister Loretta "Lori" Suess. Senior Citizen Center Activities Fund in honor of their mother, Donna that will be donated to the local senior center activities.